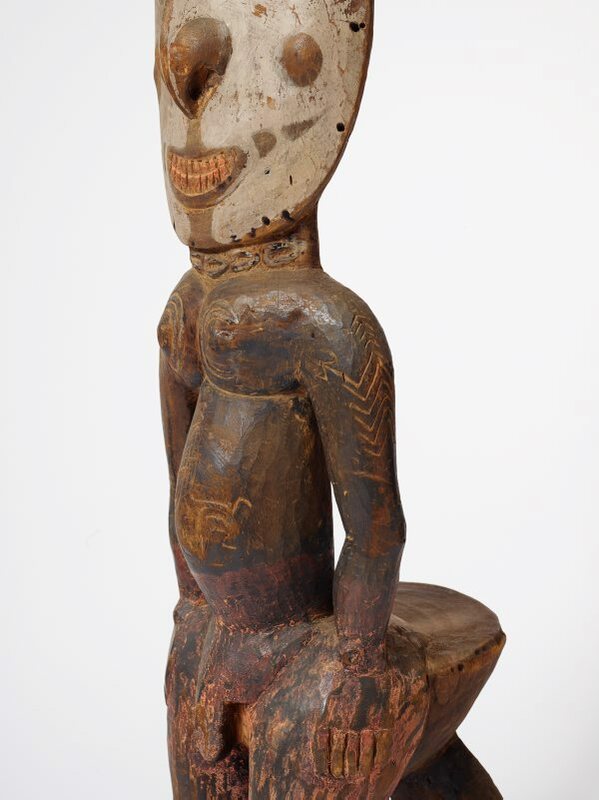 Claytus Yambon of Korogo village describes four types of 'tikit' (stool) found in Iatmul villages: 'vala tikit' (canoe stool), 'gaai tikit' (house stool), 'geko tikit' used by men in the 'geko' (men's ceremonial house), and the 'kaua tikit', found in the centre of every 'geko'. When men debate, the leaves of the 'kaua' (Cordyline) plant are placed one by one on the 'kaua tikit' to emphasise a point. 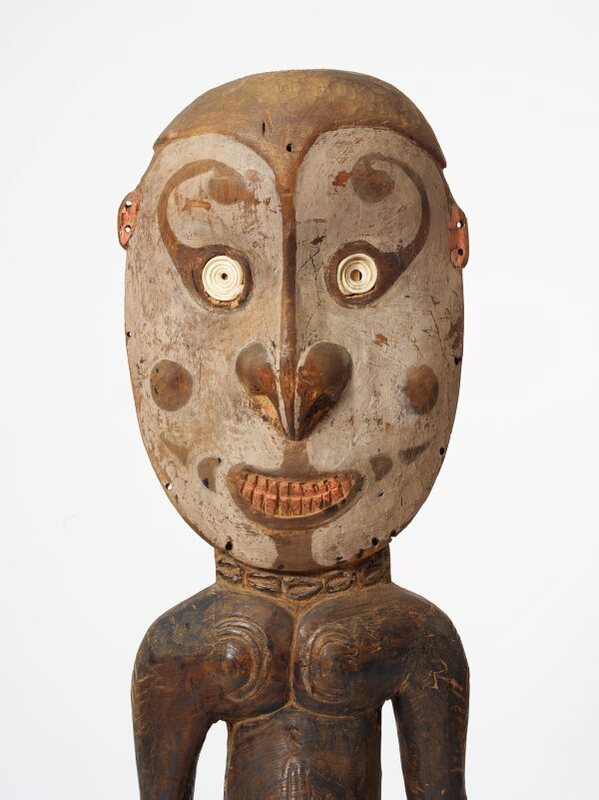 'Kaua tikit' and the sacred 'garamut' slit drum represent the village, and the power to control the village is sounded on the 'kaua tikit' and the 'garamut' to call the spirits. 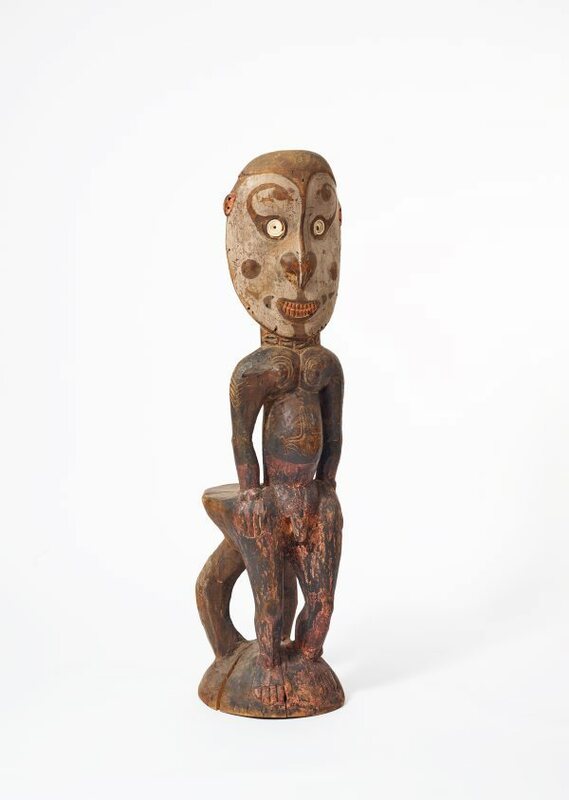 The body of the figure on this 'kaua tikit' shows ritual scarification marks, with a 'yatjanji' (four-pointed star) surrounding the navel, as conveyed by Toby Wanaki of Tegowi village. JA Tuckson, Art and Australia , 'Primitive art collection', pg. 76-79, Sydney, Jul 1972, 78 (illus. ), 79 (illus.). Reproduction on page 79 show 'Teket' on display in the Primitive Gallery at the Art Gallery of New South Wales in 1972. Art Gallery of New South Wales Quarterly (vol. 13, no. 4) , Sydney, Jul 1972, 697 (illus.). "The primitive art area is temporarily situated on the first floor. 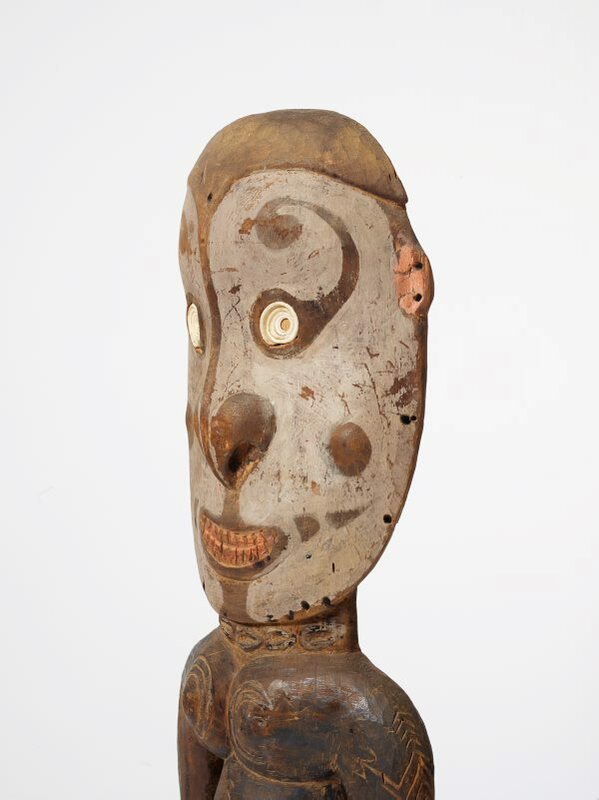 Exhibits are from the Sepik River, New Guinea, along with a grave-symbol figure from New Hebrides, in the left foreground". The Teket is seen in the centre of the room, together with other works collected by Tuckson in the 1960s and early 1970s. Art Gallery of New South Wales Quarterly, vol 4, no 3 , Sydney, Apr 1963, front cover (illus. ).